A mouse pad is one of those things you just need if you are using a mouse. OK you think you don’t need one but when you use one you know you do. 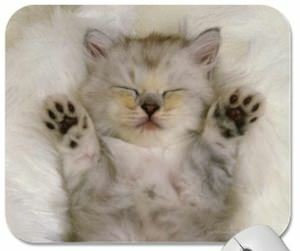 This mouse pad shows a cute little kitty cat while sleeping with her paws in the air. Of course this kitten is dreaming about catching mice, just hope that she wakes up and catches your computer mouse. This kitten mouse pad is 9.25 x 7.75 inch and has a non slip back so that it stays in plays even when using it for the most difficult tasks. So if you like mice and kittens then you just need this Sleeping Kitten Mouse Pad.